Spotted on the wrist of Scarlett Byrne on the Vampire Diaries season 7 premiere was the Celtic Dragon bracelet by Bead Lovers Korner! I was really excited to see that it was chosen to be worn on the show! The Celtic Dragon bracelet was gifted in consideration for use to the wardrobe stylist team of the CW Network series in a collaborative gift bag from The Artisan Group®. Scarlett Bryne as the character “Nora” wears the Celtic Dragon bracelet in the first few scenes of the long-awaited “The Vampire Diaries” season 7 premiere. The TVD episode title “Day One of Twenty-two Thousand, Give or Take” aired on October 8, 2015. Nora is seen in this tweeted photo below wearing the bracelet, made with red sesame jasper, which complemented the floral theme in her blouse. 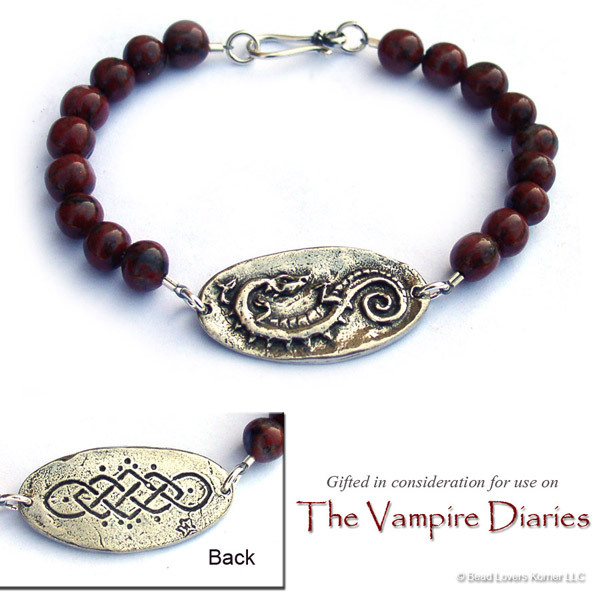 Celtic Dragon Bracelet by Bead Lovers Korner, as seen on the season 7 premiere of “The Vampire Diaries”. This bracelet is not an imitation, protected by © copyright. As seen on TV, this bracelet is available for purchase on our website.